En Vogue, Tony Tony Tone and more musical artists from Oakland could help answer this question. In this episode we meet two gentlemen creating a documentary that will help others do the same. The second part of today’s podcast explores Hip Hop from two angles you may have not known existed. * Krip Hop Nation, an international network for artists with disabilities. * Hip Learning, using the rap element of Hip Hop to help children learn science and more! Press on the button that says Play! … Oh snap, #Bars son! even if you don’t feel that’s something you celebrate or even really acknowledge. chances are great that you have been impacted by African American people. There’s so much from the world of invention, science and culture. An unfortunately, that’s not discussed during the other 11 months of the year. Today’s episode includes a recent piece for Gatewave Radio that shows how sometimes people are like pieces in a puzzle. If one piece is missing, that full puzzle can never be complete. Following the Gatewave piece you will hear more from two brothers who in their own way are expanding Black history. And , making sure we know, that includes people with disabilities. Today, the question, Who is Joe Capers? all had a few things in common. I spoke with two gentlemen from California’s Bay Area. First up, Leroy Moore, originally from the east coast, raised in Connecticut and New York City. I’m an activist, journalist and author. I also started what’s called Krip-Hop Nation with a K. It’s an international network of musicians with disabilities. My disability is Cerebral Palsy. I had it since birth. I found out about Joe Capers when I was doing radio. KpFA out here in Berkley. They had a radio show about people with disabilities. 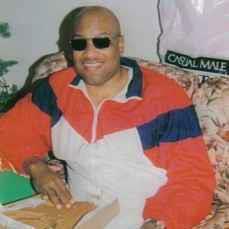 Joe Capers was blind African American man here in Oakland in the 70’s, 80’s and 90’s. He had one of the first accessible home studios at that time. Leroy learned of another person who could help further answer the question… who is joe capers? I got a call from Leroy one day, he said “Naru you knew Joe Capers?” I was like yeah Joe? Meet Naru Kwina , an Oakland California based artist and teacher. .
Joe was just the coolest guy with the biggest smile. Joe played the base, the drums the keyboards so he was a master musician. Was Joe doing more of the production? Was he just kind of the studio owner? What was he actually doing? Listen brother! His studio was called “J-Jams Studio: Joe did everything. He had his mix board in Braille. He recorded, he engineered he mixed, he produced. He did everything that you could every possibly do in the studio. And he had the greatest ear I have ever been around and I’ve been doing music over 40 years of my life. If you had one note or one little thing off he knew and he would call you on it. You know because he was blind you thought you’d get away with stuff. Joe was a professional and demanded that those in his studio acted the same. Naru, who is also a rapper, and went by the name Quick back then, recalls the time when Joe instructed him to memorize his lyrics and not use written notes in the recording booth. I’m in the booth one day and I had my little paper… like nah he ain’t gonna know… [laughs] he was like bruh, I could hear the paper rattling in the booth. And he sent me home. He sent me home and told me not to come back until I knew my lyrics. So he was really dedicated to the music and that dedication is still with me and when I started having my own studio and production I always said nope don’t come in here with no paper, learn your lyrics. [Laughs] So I got that from Joe! Learning more about Joe, Leroy was surprised others didn’t know him. Oh my god, this man needs to be recognized in Oakland because he really changed the Oakland sound of Hip-Hop and Soul. During that conversation between Naru and Leroy the idea was sparked. When I said you know somebody outta do a film about Joe, he [Leroy] said why don’t you do it. I said man, I’m not a film maker man… he said but yeah you know people. Reluctantly, I took that upon myself. there’s lots involved in the process. I just contacted people who had cameras, mics and I had to contact all the artists. I literally probably have 6 or 7 hours of interviews. Everybody from MC Hammer, Digital Underground, Dwayne Wiggins from Tony tony Tone and other people who just knew Joe on a personal level or recorded with Joe… who were closer with Joe. Some of the more interesting interviews are from people you would never heard about who Joe touched in a particular way. I could just say that he’s still here with us because all the people he touched and how many people still think about Joe. What began as a 15 minute documentary about the career of Joe Capers has morphed into much more. Running his own studio known as J-Jams wasn’t solely a business venture. This was back in the error when recording music professionally required significant investment. Large studios charged hundreds of dollars an hour for studio time. Joe was changing like between $20 or $25 an hour r. The quality of sound was on par with anything coming out of these big studios. Joe knew the music that we were doing. He understood it better than some of the engineers who were in these big studios who were used to . doing rock music or folk and country. Joe understood the R&B and the Hip-Hop… the need for that bottom. While the music might be about that base, for Joe it included the chance to offer help and encouragement. He was also a teacher. He would take young kids off the street from time to time. Some people were actually living with him. He would teach young kids to engineer. Pretty much gave at least two people I know roofs over their heads until they got their act together. They might have been out doing some street business and he didn’t really want that. So he was trying to teach people another way to make money and be successful. Joe Capers taught newly blind people independent living skills. Making a documentary takes a lot of patience and research. It also takes creativity. Not only in the traditional sense as in the filming and writing, but also in the approach to resolving real challenges that inevitably arise. In order to make up for a lack of video footage of Joe and artists in the recording studio, original animation is being incorporated into the film. And I am pleased to report that plans are included for audio description, making the film more accessible to those with vision loss. When complete the film will be distributed by way of local public television, online, film festivals and live screenings. Events developed around the release of the film will include a live concert focusing on emerging artists including those with disabilities. The concert will be an annual event taking place in August. in Oakland, this now has significant meaning. Every August is now Joe Capers month in Oakland. That’s the first Black Disabled man that’s been recognized by the city of Oakland. I’m working on some more funding right now that’s why it’s slow going. Everything’s been like a labor of love out of my pocket. And Leroy put some money in as well. I have a nonprofit, it’s called Alternative Minds Foundation and so all our stuff is going through there with this film. It’s a 501-3C so everything is a tax write off for people who want to do that. And just later on just telling people about it when it comes out. That’s probably the best way you could help spread the word. It sounds like these two are the right choice for telling Joe’s story. rappers, dj’s, producers, dancers, spoken word artists and others, all with disability; have already presented an award in recognition of Joe’s contributions. This award was presented to his family in Georgia. Naru who had a personal relationship with Joe, while not as familiar with blindness, did gain what some may see as a simple lesson, but in fact is one that advocates have spent a life time trying to convey. My understanding about a person who was blind is very limited and probably very skewed. Being around Joe was very refreshing. He was just a regular person, did regular things. Loved to joke and laugh, play tricks on you and all of that stuff. He was just like we say, a regular Oakland Cat! Oh my God, this man needs to be recognized. The first time I thought about Hip Hop and disability was just prior to me losing my sight. It was the fall of 2003, I believe it was MTV2 who was airing a rap battle. One of the contestants included young rapper by the name of Blind Fury. I remember thinking his opponent was corny. He got stuck on the blind and disregarded the fury. had a method for finding out visual details about his opponents and he had multiple flows. I realized the perception of Blind Fury’s talent was based on his disability. Why would blindness limit the ability to rap? It’s vocal, what’s the big deal. Yes, battle rap might require the ability to quickly gain information about your opponent, but Blind Fury was making that happen too. Eventually Blind Fury took his place in history with his success on BET’s 106 and Park’s Friday Freestyle. The truth is people with disabilities have been involved with hip hop since its origins. Leroy prior to his interest in rap was into rock and heavy metal. He was then introduced to Rapper’s Delight, from the Sugar hill Gang. Back then you bought the record and tried to learn all the lyrics. This is gonna be cool! At that time I had a walker . So picture me with my walker going to the subway to the Bronx. Here I am this skinny guy with a walker and everybody around me has muscles, break dancing and all that stuff. If you’re not familiar with the ciphers, rappers would get together to rhyme with one another. A time to test your newly written verse or maybe freestyle. Picture a circle of rappers passing the imaginary microphone to one another. It’s a meticulous process. You wait your turn. And you better be ready because you are going to get instant feedback on your 16 bars, or your verse. This is the place where you truly hone your skills. groups of mainly African American and Latino young men attracted the attention of the police. Becoming more familiar with Leroy’s presence, he was soon declared “The Watch Man”. Because you’re disabled you can watch out for the cops. The cops won’t do nothing to you . When the cops came I used to yell you know, “po po” and they used to scatter. They’d just leave me there with my walker and the cops used to get so pissed off. Leroy played his position . He listened to more and more music. When Run-DMC came out and did “Walk this Way” and mixed rock with rap I was like alright this is it! Right before I was scheduled to speak with Leroy, I read an interview he did with Daryl McDaniel’s better known as DMC of Run-DMC fame. Now, when I heard [It’s Like That] as a young teenager, I lost my [Censored Beep] mind! What was that like meeting DMC? Oh my God, you know, I told him I grew up with you… he’s like no no we grew up together! For me it’s one of the highlights of my journalism career. I saw that DMC had a book out about his depression. I also knew that back in I think the late 80’s he had a voice disability. I was like ok, DMC needs to know about Krip-Hop. And more people need to know about Krip Hop. You know what I’m talking about because chances are you experienced it from at least one side or both. Leroy never did participate in any of those early Bronx ciphers, but Hip Hop did get into him. One important aspect of art and culture, is seeing yourself represented on the screen, on the canvas or stage and in the music. As a black disabled man, that doesn’t happen that often. My father had a huge Blues record collection and of course as we know Blues artists were blind… like Blind Willie Johnson. Wow, there’s disabled Black men that do music! I think it played a really big part of where I am today with Krip-Hop. So we saw Krip-Hop as a way to bring awareness around the history of disabled musicians from the Blues to Hip-Hop and really educate and to push the Hip-Hop arena around Ableism thinking around disability and to really say that disabled musicians have been here since the Blues. Krip Hop Nation produces live events featuring all sorts of artists with disabilities including; dj’s, emcee’s, spoken word artist, dancers and more. They have put out 4 CD’s including their latest. Our 10th Anniversary CD just came out on CDBaby.com. It has Wonder Mike from the Sugar Hill Gang, DMC from Run-DMC. including instruments so turn tables and beat boxing became its replacements. Barred from the downtown discos and night clubs; the community centers and parks became their place to party. Hip Hop is a culture that created an outlet for expression. rebelling against oppression, yet the disability experience goes mainly unheard. Whether changing commonly held beliefs or getting young students to recall all types of information. That’s where Naru saw a way to use his love for hip hop and combine it with his love of teaching. While working as an assistant teacher he had the challenge of trying to teach science to kindergartners. But, man, they knew the whole song…. If I could turn these lessons into music like that and get these kids excited I wonder if they would learn these lessons like they learned that song? So I did a series of songs about the body and gave them to my students, the CD’s to the parents to take home and listen to and then we did some in class. I mean they caught it so fast, it was amazing. I ended up applying for my first grant. It’s a grant called the Creative Work Fund. It was a partnership with this organization called the African Scientific Institute out here in Oakland. We got the grant. $35,000 grant. I was able to produce a play, the CD and pay a lot of people in my community as well to perform and got other artist involved to record with me. That’s about 10 years ago. I’m still doing it to this day. Outperforming , online sales. It became half of my career. I’m still an after school teacher but I do a lot of Hip Science. I enjoy it! What was that reaction like from the other teachers? Were they cool with this or did you get any negative feedback from them? They were amazed. First of all I don’t think any of them knew I rapped. I don’t know why but I kind of kept that part of my life separate from working with the children and never realized that was one of my strengths. I should have been using it all along. I never even thought it would be anything like that. I just wanted my kids to learn. And it wasn’t just his kids that were learning. Shortly after releasing the CD series he received a call from a company interested in the product. This company, it’s called Overbrook Entertainment and they wanted to buy [laughter] my whole business. I’m like what? I’m not selling my business. And it turns out that was Will Smith’s company. He was in town in San Francisco shooting the Pursuit of Happiness and I don’t know how he got my CD’s but his kids were listening to it. I never finished the negotiations because they were talking about they wanted to have all the marketing … I wasn’t looking to sell. It was like this is my baby right here! He creates music with his daughter who herself is a singer and rapper at the Oakland School for the Arts. Matter of fact, the first song she ever wrote with me she was 3. It was called love is the thing It’s featured on Rosie O’Donnell Family is a Family documentary. We did a video for it and everything. It was real cool! Over several summers, the two have written a book that’s now complete and he and his daughter are creating an accompanying soundtrack. It’s called Panela’s Journey. It’s a very fanciful tale of a young girl who’s struggling with her identity in the world and her place in the world and wondering why the world is the way it is. She seeks refuge in a fanciful place. That one should be coming out soon as well. We’re gonna have some augmented reality, apps that go along with the book. Continuing to put out his own music, his latest project should be out soon. Naru and Strong Soul and we are The Living Room Legends! I have some links on the blog… Reid my mind .com if you want to check out more on both Leroy and Naru. Salute to both of these brothers for the good work their doing, truly expanding the culture. I don’t know about you but I feel like I have to start producing some more content! n that note, make sure you subscribe to this podcast. Go to your podcast app of choice and search for Reid My Mind Radio… that’s R E I D.
You can also follow me on Sound Cloud soundcloud.com/t-Reid. I’m Old enough to remember when people not of my generation thought rap music was a fad. They never thought it would become what it is today… a worldwide billion dollar, trend setting industry. I’m sure they never thought how this art form could end up being a bridge for a 19 year old young lady adjusting to her vision loss. Young Ant, is spittin’ lyrics about her own experience adjusting to blindness. And I have a feeling that’s just the beginning… Come meet the young lady and rapper! Team Ant!!! Hit Play below and act like you know! What’s good everybody, back this week with another episode of Reid My Mind Radio and I’m very excited to bring you this latest piece produced for Gatewave . Take a listen and I’ll be back with some thoughts. Antynette is a young lady who has been through a lot in a little bit over a year and half and is trying to find her through it with adjusting and coping and in different techniques that I’m learning and trying to find different avenues of expressing how I’m feeling. Yeh so one of the things that I like to hear from people adjusting to blindness is that they don’t first start with who they are with the fact that they are blind. You said you are a young lady! Maybe that’s not what you expected to hear from an upcoming rapper. who lost her sight only a little over a year ago can talk about counting her blessings. what it means to be blind and what it means to be a rap artist. 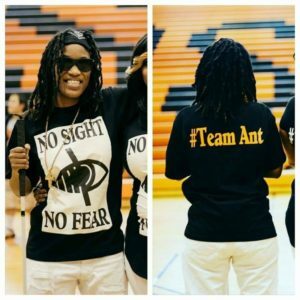 Antynette Walker, 19 years old, lost her sight in the middle of her senior year in high school. Antynette was born prematurely and she had eye surgery done on her eyes at the age of 1 to correct her vision. They told me that her eyes will be just perfectly fine; in which they was over the years. This is Marsell Walker, Antoinette’s mother. At 11 years old Antynette began losing her vision. Living in Atlanta at the time Marsell began searching for a reason for her daughter’s vision loss. We started taking her to different doctors, getting different tests run and no one could tell us a reason why this was happening to her eye. They just kept prescribing different glasses for her eyes and after the years went on we just started coping with her losing vision in her left eye at the age of 11. In 2015 Antoinette began experiencing complications in her right eye. Still seeking that diagnosis, the family moved to Minneapolis where she was first being treated at the University of Minnesota. He really didn’t see any dramatic changes within her vision from when she started seeing him. And she was going in complaining about the blurriness and spottiness and these were the same symptoms and things that she was going through at the age of 11 when she lost her vision in her left eye. He somewhat tried to make it feel like she was hallucinating and it was all in her head and she knew off hand that it wasn’t so she asked me to get a referral to a newer doctor which is at the Mayo Clinic in Rochester. Seen by Ophthalmologist’s, Neurologist and other specialists at the Mayo Clinic, doctors had a very different opinion from the original doctor at the University of Minnesota. That’s when they did notice her vision was changing dramatically. And he couldn’t even figure out why that previous doctor would tell us he seen no changes. She woke up not being able to see anything and that point he asked for us to do Steroids with Antynette for about a week… it didn’t work! That day she woke up blind, was Christmas 2015! I mean, you’re her mom, and you’re watching your daughter lose her sight. It was really, really stressful. I have always been that parent who where if something is wrong with your kids you find a way of fixing it. Your kids feed off of your energy, so I had to keep being positive. I’ll go in my room I’ll cry, I won’t let her know I was crying. I’ll come back out and as if nothing happened, but you know I didn’t know what to do. I was just numb! This was her senior year in high school. Antoinette should have been thinking about the prom, her future. Now she had to return to school after Christmas break, to a whole new way of life. What was that first day of school like for you? Well, it was hard. Everything was much louder, it was just harder to navigate through crowds and different hallways. It was so much anxiety the first day going back because it was just new way of life, new environment, everything was just all brand new. What was the reaction of your classmates? Everyone was shocked. Everyone was surprised . People more so didn’t believe it because they were just like last time I saw you you were able to see now you’re blind. More people were stand offish kind of and some people were supportive because some people knew what I was going through and knew that it was gonna happen and because we were that close and we talked about it frequently. But some were rude. I think that was mainly because they didn’t know how to take it and they didn’t know what was a proper reaction. That’s a mature response from you in terms of how you responded to those people who were being , you know, negative. There’s going to be some people that you know, they don’t know any better or their parents didn’t teach them any better so there gonna you know make fun or say things that are inappropriate, but you gotta just learn to ignore it. Some people are for you, some people are against you. Not everyone is gonna be on your side. On the same side; like on a team! Team Ant! That’s the official name of Young Ant’s crew, her support system her family. working with her throughout this new journey. He’s focusing on making her greater. He’s there hands on. It’s her message, but he knows a lot about rap so he has a big input on her delivery. And are you playing the role of manager/marketer? What’s your role? Hooking up photo shoots and videos hooking up studio time and reaching out to different people to try and get her story out there. And her father is the one that comes and oversee everything and makes sure it sounds right. The oldest of 4 siblings, setting an example for them is really important to Antynette. She’s working hard at improving all of her skills. That’s Braille, navigating with her white cane, independent living skills and learning to use a screen reader and computer. Traditionally, One of the most important aspects of being a rapper is writing your own rhymes. At least, if you want any true rap Aficionado to take you seriously. Are you writing your own rhymes right now? How do you feel about the writing? Does that mean something to you as opposed to having others write your rhymes? Yeh, Because before I went blind I was a big writer. I wanted to be a novelist. I used to write short stories and poems and different things of that sort. So I feel like you know with me losing my sight it doesn’t mean that have to stop doing what I love doing. Now I have to be more repetitive when I’m writing the stuff so I can remember it. In any art form, early influences can help develop an artist’s own unique style. For real! I ain’t joking! Right, get to the roots! Based on the artists mentioned I’d say Young Ant has some knowledge of rap music’s pioneers. She likes lyricists, music with a message and showmanship. I like to call myself a motivational rapper. I’m mainly aiming to inspire, to motivate, to let everyone know that no matter what you’re going through and no matter what happens that doesn’t mean that your life stops just because you’re diagnosed with a certain thing or something traumatic happens in your life. People in society tell you that you can no longer go on. You can be whatever you want to be and you can do whatever you want to do if you set your mind to it. All my music is positive and clean. You know fun, uplifting and motivational. She’s gearing up for some live performances later this year. Like the South by Southwest festival in Austin Texas and Coast to Coast in Atlanta. How do you navigate the stage? Usually, I go on before to get a feel for the stage you know to see how big it is to see what I’m working with. And then you know once I get a feel for how big or small it is , I kind of just you know [exhale!] let loose! Young Ant is just getting started and open to collaborating with other artists. I would love to do a song with Stevie Wonder. That’s like the top of my list. Hold on, you’re a Stevie fan too! You’ve always been a Stevie fan? Now I’m gonna test you. You’re talking to a real Stevie head right now. Tell me what you like. Give me a song. I like Superstitious! That’s that’s my jam! There’s definitely something wonderful about this young lady. Maybe it’s the inner strength that shines through her words and personality. The determination that’s helping her adjust to blindness and pursue her goals. which by the way, has never been that open to disability. Young Ant though has a team. A support system that’s lead by the two people who love her most, mom and dad. That’s an asset whether adjusting to blindness or starting a music career. To listen to this track called Count your Blessings go to Sound Cloud and follow her on social media. 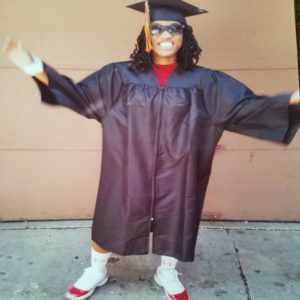 Young Ant, first blind female rapper. You can find her on YouTube as Young ANT. On Twitter , Sound Cloud, Instagram as YoungAnt1121. Her Facebook page is Team Ant. For Gatewave Radio, Audio for Independent Living! This is why I like producing this podcast. As a father of two incredibly gifted, intelligent and beautiful young ladies I was drawn to this story. I understand the value of speaking with someone who has walked in your shoes. it’s natural to think that the opportunity has faded away. All it takes though, is a glimpse of chance or hope to peek through. That could be a small success. Young Ant is only one year into her adjustment process. Honestly, to some extent I think that process is lifelong. Not like a life sentence, but rather like a commitment. seeing happiness not as a destination but a daily process. Now, you know what’s not a daily process? I ‘m talking about young ant, but feel free to become a fan of the podcast too! Seriously, I hope you all heard the character, strength and maturity like I did and become a fan of both the young lady, Antynette and of course, the rapper Young Ant! Many would assume growing up blind in the 1950’s & 60’s had its challenges. What about growing up Black and Blind attending a segregated school for the blind? In this latest Reid My Mind Radio you hear from the Executive Director of the Radio Reading Network of Maryland, Robert Lewis. Playing music with Stevie Wonder and much more. Plus in the special podcast edition, we include some of his personal music suggestions for those times when you just need a lift! I know some of us are not feeling that happy in 2017 and possibly longer. I don’t know like 4 years! Well, as long as we’re not six feet under or my personal favorite stuffed into an ern sitting on a mantle… we’re good and we can make things happen. We can fight…fight the power! But first a new Gatewave piece I know you’re going to like and some extra immediately following! Meet Robert Lewis, the Executive Director of the Radio Reading Network of Maryland. With over 35 years in the business, he is more than qualified to run the network. We’ll hear more on that, but it’s his life experiences that are truly compelling and offer a glimpse to what it was like growing up as an African American attending a segregated school for the blind. I went to the Maryland School for the Blind, here in Baltimore Maryland. It was a wonderful place to go to school. I started there in 1954. It was a nice school but in the very beginning there was one side for the blacks and one side for the whites. And you were not allowed to sleep on the white campus . The two races went together for school but after that we would go our separate ways the first couple of years that I was there. That’s the way they had the whole setup. Things were done to you or things were done that would not be tolerated today. In the beginning they wouldn’t buy Black kids Braille writers and things of that nature until like 50’s or more like in the 60’s. They started doing some things for Black kids that they didn’t do before and they would do them for the white kids. You would be surprised what we had to deal with in the 50’s and 60’s in a blind school. The discrimination, limited social interactions, like at parties. As soon as we started to dance with one of the white girls, the party was over. That party was ended! They weren’t going to have that. Society makes people prejudice. If they had left us alone it would never had happen, but because the teachers and because of the house parents and so forth letting you know that you were black, who cared? The Lion’s Club used to come out and deal with us. And at one time the Lion’s Club did not deal with Black kids. the discrimination lead to varying degrees of abuse. During a school Halloween party, a member of the Lions Club was responsible for guiding Robert to his chair. He grabbed both my arms and walked me backwards to the chair. I’m a 6 year old kid and this is a full grown man and he was squeezing my arms as hard as he could to try and make me cry and I said to myself he’s trying to hurt me but I’m not going to let him know that it hurt. So I didn’t and after he got me to the chair he pushed me down with a little bit of force. That was his way of saying well I don’t really like doing this or I don’t like Black people and I don’t like Black kids. There was the even more abusive punishments dealt out by those charged with protecting and educating blind children. Some of the Black kids were punished to the point that we had to stand out in the hall at night with no clothes on. First we didn’t understand it but then we realized that the person that was doing that may have had a little problem on the side. The discrimination continued as Robert traveled outside of the state competing with the school Wrestling team. He recalls, they couldn’t eat in restaurants. We went to one restaurant and the lady said you got to eat as fast as you can so we can get you out of here before the owner comes back because if he saw we had Black people here he would fire me! Eventually, the segregation came to an end. The children lived together. At first the parents were very upset about it and they didn’t really want it but in order for the school to get money from the state, they had to integrate the school. Remember, Robert described the time he spent at the Maryland School for the Blind as wonderful. Discrimination and racism were just a part of his school life. We had a lot of terrible things that we dealt with but we also had good things because we had a lot of white friends that we went to school with that would do anything in the world for us. Maryland School for the Blind had one of the best wrestling and track teams in the country so we went all over the place. We learned so much and we had so much fun as far as the students together. We had a really good soul band good jazz band. I grew up with the Beatles . I grew up with the platters. I grew up with Elvis Presley. Some of the kids that were white, we learned their music and they learned ours. I would come home and my sister would say here comes the little white boy! In some sense, Robert really does straddle two identities. Not black and white, but rather black and blind. The intersection of the two present a fully unique experience. As a young African American growing up in Baltimore Maryland in the 1950’s and 60’s , Robert observed the events taking place in his neighborhood from a different perspective. I heard one day when the police came out and they sicked the Shepard on the neighborhood and one guy named frank grabbed the dog around his neck and killed him. You could hear in the wagon, you could hear the beating he was getting. The wagon he refers to is the police patty wagon used to round up and transport suspects charged with criminal acts. Robert says that the recent episodes of police brutality in cities like Baltimore aren’t new. When they would beat the kids in the wagon, you could hear the wagon going up and down. if they wanted to find out if you were telling the truth they would take a phone book and put it on top of your head and then hit it with a police stick. And there were no scars. What they would do is open the window. they’d say you can tell us what we need to know or you can jump out the window. or take the beating. Once , the additional identity of being blind could have possibly saved his life. As a young boy traveling in the car with his family, he recalls when an officer stopped his father for speeding. the police was giving my father a ticket and I reached out to touch his gun and the policeman stepped back and drew his gun to shoot me. My father said oh please don’t shoot my son, he’s blind. And the policeman said oh he’s blind? So he took the bullets out of the gun and put it in my hand and let me play with it . He said, I’m not going to give you a ticket I’ll let you go this time. He said, but every day for the next week I want you to buy your son an ice cream cone and every night for the rest of the week he’d come by the neighborhood and say did your father buy you an ice cream? By no means was Robert’s childhood full of violence. residing on the school campus during the week, he returned home on weekends. Man it was fun because I could come home and tell them what I learned as far as in school, but then I could get on the roller skates and skate up and down the sidewalk and ride my two wheel bike. My grandfather was a mechanic, I had my hands inside automobiles. My mother would take me to the five and dime store and let me buy a toy. She treated me just like she did all of her other kids. My cousin Mack Lewis had a boxing gym in Baltimore. He was a very well-known manager of boxing. He would train Larry Middleton Vincent Pettway… some of the big time boxers. I would go over to the gym and listen to the guys box. I’d go around listening to musicians. I went over to the stable and rode the horses. I could honestly say I felt just like any kid that could see because I really think I had some angels looking out for me. I really enjoyed hearing things and dealing with things that I dealt with you know in the neighborhood. Friday nights and Saturday nights was a great time because everybody had a good time. They had crab feasts. They’d walk up and down the street. So you were not at all isolated. You were definitely part of the community it sounds like. I was part of the community, yes! Community, in his neighborhood, school and even activities that lead to lifelong passions like music. I got my start playing marching band music. I played Sousaphone in the band. I played the Base Drum and from there I went to a complete drum kit. Being totally blind and a drummer, drummer’s completely different than other musicians. When you go and tell people you are blind and you play drums … I told one guy and he said I mean, I could see you playing the horn, but ain’t no way in the world I can see you playing the drum set cause you blind. How you gonna find the drums and the cymbals. I play an 18 piece drum kit! I’m a very good drummer. I played with 15 and 18 piece bands. I played with Stevie before. So we’re clear, he’s talking about Stevie Wonder. He came to the Maryland School for the Blind and we played together. Today, Robert is back on the campus of the Maryland School for the blind. 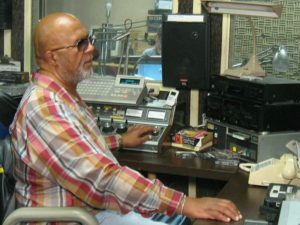 Not with the school, but rather in his job with the Maryland Radio Reading Network, a radio reading service for the blind and others with print disabilities. I started as a board operator and I’d go to work and people would whisper and say is he blind? This is a radio reading service but they had no blind people working there. I started as a board operator and moved up the ladder and I became the Executive Director. Fundraising, directing, , setting up all the program, fire those that need to be fired or hire the people that need to be hired. What would you say are the aspects of your specific experience that have either helped or make your job more challenging? The hardest thing is proving things to people. Proving what you can do. I love my job and I like what I’m doing. If I sit home retired I’ll probably weigh a thousand pounds. so I’m trying to avoid that or find something else to do probably go into some music, but right now my whole job is what I do now with the radio station and part-time stereo sales. James Brown’s “… And Proud! TR:The intersection between disability and race, gender and other identities is something I’d like to explore more. It’s now part of my own life experience and with people with disabilities being the largest minority group, it’s probably an effective way to promote disability related issues. It was a real pleasure speaking with Mr. Lewis and I hope to do so again. I can just imagine all of the other stories he could share. In fact, there are more stories that were not included in the Gatewave piece. Sometimes it’s hard to explain the level of ignorance people display in response to blindness or disability. Some of the stories can be entertaining, but often they’re confusing. And as I like to say, you can’t make sense from nonsense. As you heard in the end of the Gatewave piece, Robert sells stereo equipment part time. After selling some equipment, he called the customer to check in with him two weeks after the sale. He said, as long as you live please don’t ever call me. I said, don’t ever call you again? He said no, because I have to have eye surgery next week. … and I know it’s only because I bought that equipment from you. I said to him, did it rub off? He said please never, NEVER, never call me again! Recently I was reminded about someone who I knew for years, who didn’t say this to me but definitely treated me as if I were contagious! I wanted to end the conversation on a positive note because we all know those haters are going to hate and ignorance is out here! Plus it would only be right especially profiling someone who has been through all that he has and refers to his experience as wonderful. That’s an optimist folks! I asked Mr. Lewis to give me some music recommendations. I thought I’d pass them on to the podcast listeners who enjoy a variety of music. I don’t really listen to a lot of the new stuff. If you’re a gospel person I consider the older gospel like Aretha Franklin or James Cleveland to be outstanding. If you really want to get into the going back into the world and listening to oldies but goodies and things of that nature think songs like “What’s to become of the broken hearted”. robins had some really good stuff out. “The Masters Call” It talks about a situation that a guy got involved with and was able to find god. When I’m really down if I want to hear something nice I listen to “Palisades Park” by Freddie Boom Boom Canon which really is a very nice song to give you a little bit of upbeat or some things by gene Pitney or things like that really will help you, inspire you music wise. Just getting a boost. Even down to Leslie Gore. I don’t mean songs like “It’s my party” but I mean really good songs that she did that were just outstanding; “Love and spoonful”. The Temptations had an unbelievable bunch of songs that really move me. I mean I love music. There’s so much music that that I really really enjoy. When you look at big bands sounds. I think one of the best instrumentals that I ever heard in my life was Jimmy Smith’s “Mojo”. And only because no one plays an organ like Jimmy Smith. No one can move their hands and feet like he does; God bless the musician! He was unbelievable! If you listen to that song and you listen to his right hand what he’s doing with his right hand is beyond what a musician can do. I enjoy so much of the old stuff. I mean Mandrill. I like a horn section. I love tower of Power. Ray Charles’ band moved media also have to put Jimi Hendrix in that line up. There’s so much harmony in some of the groups that came out of England. Crosby, Still, Nash &young. To me Cold Blood has an unbelievable band. They have Lydia Pense who sings for them. Oh my God that girl can sing! James Brown’s band was fantastic. More so than his singing. His band was as tight as they come. But Ten Wheel Drive is also another tight band to listen to. And also Gail McCormick and Smith. They took the version of the Shirelle’s Baby it’s you. They have a horn section there that is fantastic. There’s nothing like 8 or 9 horns playing together like that . Like Tower Power does… My dream someday would be to play a song with Tower of Power or Ten Wheel Drive. These guys are tight! Now before you go to your choice of music apps and begin listening to some of these suggestions, do yourself a favor and head over to your podcast app and subscribe to Reid My Mind Radio. It’s good for your mind, your body and your soul! Taking over the Reid My Mind Radio Studio once again for a year end special…Rizzle Razzle. I asked for your help in convincing my daughters to let me be a part of their end of year wrap up. This year, they cover music, iPhone apps and phrases. Find out who made their lists. Find out if I made the show!